For methods of applying a 2D image onto a 3D surface, see pad printing. For methods of copying 2D parallax stereograms that seem 3D to the eye, see lenticular printing and holography. 3D printing, also known as additive manufacturing (AM), refers to processes used to synthesize a three-dimensional object in which successive layers of material are formed under computer control to create an object. Objects can be of almost any shape or geometry and are produced using digital model data from a 3D model or another electronic data source such as an Additive Manufacturing File (AMF) file. Futurologist Jeremy Rifkin claimed that 3D printing or AM signals the beginning of a third industrial revolution, succeeding the production line assembly that dominated manufacturing starting in the late 19th century. The term 3D printing has its origin sense, 3D printing in reference to a process that deposits a binder material onto a powder bed with inkjet printer heads layer by layer. More recently, the term is being used in popular vernacular to encompass a wider variety of additive manufacturing techniques. United States and global Technical standards use the official term additive manufacturing for this broader sense. ISO/ASTM52900-15 defines seven categories of AM processes within its meaning: Binder Jetting, Directed Energy Deposition, Material Extrusion, Material Jetting, Powder Bed Fusion, Sheet Lamination and Vat Photopolymerization. Early additive manufacturing equipment and materials were developed in the 1980s. In 1981, Hideo Kodama of Nagoya Municipal Industrial Research Institute invented two AM fabricating methods of a three-dimensional plastic model with photo-hardening polymer, where the UV exposure area is controlled by a mask pattern or the scanning fiber transmitter. But on July 16, 1984 Alain Le Méhauté, Olivier de Witte and Jean Claude André filed their patent for the stereolithography process. It was three weeks before Chuck Hull filed his own patent for stereolithography. The application of French inventors were abandoned by the French General Electric Company (now Alcatel-Alsthom) and CILAS (The Laser Consortium). The claimed reason was "for lack of business perspective". Then in 1984, Chuck Hull of 3D Systems Corporation developed a prototype system based on a process known as stereolithography, in which layers are added by curing photopolymers with ultraviolet light lasers. Hull defined the process as a "system for generating three-dimensional objects by creating a cross-sectional pattern of the object to be formed," but this had been already invented by Kodama. Hull's contribution is the design of the STL (STereoLithography) file format widely accepted by 3D printing software as well as the digital slicing and infill strategies common to many processes today. 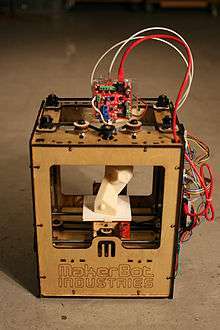 The term 3D printing originally referred to a process employing standard and custom inkjet print heads. The technology used by most 3D printers to date—especially hobbyist and consumer-oriented models—is fused deposition modeling, a special application of plastic extrusion. AM processes for metal sintering or melting (such as selective laser sintering, direct metal laser sintering, and selective laser melting) usually went by their own individual names in the 1980s and 1990s. At the time, nearly all metal working was produced by casting, fabrication, stamping, and machining; although plenty of automation was applied to those technologies (such as by robot welding and CNC), the idea of a tool or head moving through a 3D work envelope transforming a mass of raw material into a desired shape layer by layer was associated by most people only with processes that removed metal (rather than adding it), such as CNC milling, CNC EDM, and many others. But AM-type sintering was beginning to challenge that assumption. By the mid 1990s, new techniques for material deposition were developed at Stanford and Carnegie Mellon University, including microcasting and sprayed materials. Sacrificial and support materials had also become more common, enabling new object geometries. The umbrella term additive manufacturing gained wider currency in the decade of the 2000s. As the various additive processes matured, it became clear that soon metal removal would no longer be the only metalworking process done under that type of control (a tool or head moving through a 3D work envelope transforming a mass of raw material into a desired shape layer by layer). It was during this decade that the term subtractive manufacturing appeared as a retronym for the large family of machining processes with metal removal as their common theme. At this time, the term 3D printing still referred only to the polymer technologies in most minds, and the term AM was likelier to be used in metalworking and end use part production contexts than among polymer/inkjet/stereolithography enthusiasts. The term subtractive has not replaced the term machining, instead complementing it when a term that covers any removal method is needed. By the early 2010s, the terms 3D printing and additive manufacturing evolved senses in which they were alternate umbrella terms for AM technologies, one being used in popular vernacular by consumer - maker communities and the media, and the other used officially by industrial AM end use part producers, AM machine manufacturers, and global technical standards organizations. Both terms reflect the simple fact that the technologies all share the common theme of sequential-layer material addition/joining throughout a 3D work envelope under automated control. (Other terms that had been used as AM synonyms (although sometimes as hypernyms), included desktop manufacturing, rapid manufacturing, agile tooling [as the logical production-level successor to rapid prototyping], and on-demand manufacturing [which echoes on-demand printing in the 2D sense of printing].) The 2010s were the first decade in which metal end use parts such as engine brackets and large nuts would be grown (either before or instead of machining) in job production rather than obligately being machined from bar stock or plate. Agile tooling is a term used to describe the process of using modular means to design tooling that is produced by additive manufacturing or 3D printing methods to enable quick prototyping and responses to tooling and fixture needs. Agile tooling uses a cost effective and high quality method to quickly respond to customer and market needs. It can be used in hydro-forming, stamping, injection molding and other manufacturing processes. As technology matured, several authors had begun to speculate that 3D printing could aid in sustainable development in the developing world. 3D printable models may be created with a computer-aided design (CAD) package, via a 3D scanner, or by a plain digital camera and photogrammetry software. 3D printed models created with CAD result in reduced errors and can be corrected before printing, allowing verification in the design of the object before it is printed. The manual modeling process of preparing geometric data for 3D computer graphics is similar to plastic arts such as sculpting. 3D scanning is a process of collecting digital data on the shape and appearance of a real object, creating a digital model based on it. Seemingly paradoxically, more complex objects can be cheaper for 3D printing production than less complex objects. Several 3D printing processes have been invented since the late 1970s. The printers were originally large, expensive, and highly limited in what they could produce. A large number of additive processes are now available. The main differences between processes are in the way layers are deposited to create parts and in the materials that are used. Some methods melt or soften the material to produce the layers, for example. selective laser melting (SLM) or direct metal laser sintering (DMLS), selective laser sintering (SLS), fused deposition modeling (FDM), or fused filament fabrication (FFF), while others cure liquid materials using different sophisticated technologies, such as stereolithography (SLA). With laminated object manufacturing (LOM), thin layers are cut to shape and joined together (e.g., paper, polymer, metal). Each method has its own advantages and drawbacks, which is why some companies offer a choice of powder and polymer for the material used to build the object. Others sometimes use standard, off-the-shelf business paper as the build material to produce a durable prototype. The main considerations in choosing a machine are generally speed, costs of the 3D printer, of the printed prototype, choice and cost of the materials, and color capabilities. Printers that work directly with metals are generally expensive. However less expensive printers can be used to make a mold, which is then used to make metal parts. A timelapse video of a robot model (logo of Make magazine) being printed using FDM on a RepRapPro Fisher printer. Fused deposition modeling (FDM), derives from automatic polymeric foil hot air welding system, hot-melt gluing and automatic gasket deposition. Such principle has been further developed by S. Scott Crump in the late 1980s and was commercialized in 1990 by Stratasys. After the patent on this technology expired, a large open-source development community developed and both commercial and DIY variants utilizing this type of 3D printer appeared. As a result, the price of this technology has dropped by two orders of magnitude since its creation. In fused deposition modeling the model or part is produced by extruding small beads of material which harden immediately to form layers. A thermoplastic filament or metal wire that is wound on a coil is unreeled to supply material to an extrusion nozzle head (3D printer extruder). The nozzle head heats the material and turns the flow on and off. Typically stepper motors or servo motors are employed to move the extrusion head and adjust the flow. The printer usually has 3 axes of motion. A computer-aided manufacturing (CAM) software package is used to generate the G-Code that is sent to a microcontroller which controls the motors. Extrusion in 3D printing using material extrusion involves a cold end and a hot end. Various polymers are used, including acrylonitrile butadiene styrene (ABS), polycarbonate (PC), polylactic acid (PLA), high-density polyethylene (HDPE), PC/ABS, polyphenylsulfone (PPSU) and high impact polystyrene (HIPS). 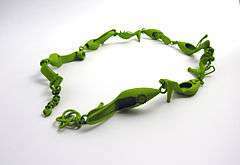 In general, the polymer is in the form of a filament fabricated from virgin resins. There are multiple projects in the open-sourced community aimed at processing post-consumer plastic waste into filament. These involve machines used to shred and extrude the plastic material into filament. Additionally, fluoropolymers such as PTFE tubing are used in the process due to the material's ability to withstand high temperatures. This ability is especially useful in transferring filaments. FDM is somewhat restricted in the variation of shapes that may be fabricated. For example, FDM usually cannot produce stalactite-like structures, since they would be unsupported during the build. Otherwise, a thin support must be designed into the structure, which can be broken away during finishing. Fused deposition modeling is also referred to as fused filament fabrication (FFF) by companies who do not hold the original patents like Stratasys does. Another 3D printing approach is the selective fusing of materials in a granular bed. The technique fuses parts of the layer and then moves upward in the working area, adding another layer of granules and repeating the process until the piece has built up. This process uses the unfused media to support overhangs and thin walls in the part being produced, which reduces the need for temporary auxiliary supports for the piece. 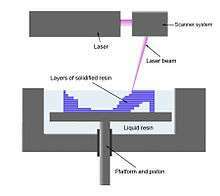 A laser is typically used to sinter the media into a solid. Examples include selective laser sintering (SLS), with both metals and polymers (e.g., PA, PA-GF, Rigid GF, PEEK, PS, Alumide, Carbonmide, elastomers), and direct metal laser sintering (DMLS). Selective laser melting (SLM) does not use sintering for the fusion of powder granules but will completely melt the powder using a high-energy laser to create fully dense materials in a layer-wise method that has mechanical properties similar to those of conventional manufactured metals. Electron beam melting (EBM) is a similar type of additive manufacturing technology for metal parts (e.g. titanium alloys). EBM manufactures parts by melting metal powder layer by layer with an electron beam in a high vacuum. Unlike metal sintering techniques that operate below melting point, EBM parts are void-free. In some printers, paper can be used as the build material, resulting in a lower cost to print. During the 1990s some companies marketed printers that cut cross sections out of special adhesive coated paper using a carbon dioxide laser and then laminated them together. In 2005 Mcor Technologies Ltd developed a different process using ordinary sheets of office paper, a tungsten carbide blade to cut the shape, and selective deposition of adhesive and pressure to bond the prototype. Stereolithography was patented in 1986 by Chuck Hull. Photopolymerization is primarily used in stereolithography (SLA) to produce a solid part from a liquid. This process was a dramatic departure from the "photosculpture" method of François Willème (1830–1905) developed in 1860 and the photopolymerization of Mitsubishi's Matsubara in 1974. The "photosculpture" method consisted of photographing a subject from a variety of equidistant angles and projecting each photograph onto a screen, where a pantograph was used to trace the outline onto modeling clay. In photo-polymerization, a vat of liquid polymer is exposed to controlled lighting under safelight conditions. The exposed liquid polymer hardens. Polymerization occurs when photopolymers are exposed to light when photopolymers contain chromophores, otherwise, the addition of molecules that are photosensitive are utilized to react with the solution to begin polymerization. Polymerization of monomers lead to cross-linking, which creates a polymer. Through these covalent bonds, the property of the solution is changed. The build plate then moves down in small increments and the liquid polymer is again exposed to light. The process repeats until the model has been built. The liquid polymer is then drained from the vat, leaving the solid model. The EnvisionTEC Perfactory is an example of a DLP rapid prototyping system. Ultra-small features can be made with the 3D micro-fabrication technique used in multiphoton photopolymerisation. This approach uses a focused laser to trace the desired 3D object into a block of gel. Due to the nonlinear nature of photo excitation, the gel is cured to a solid only in the places where the laser was focused while the remaining gel is then washed away. Feature sizes of under 100 nm are easily produced, as well as complex structures with moving and interlocked parts. In Mask-image-projection-based stereolithography a 3D digital model is sliced by a set of horizontal planes. Each slice is converted into a two-dimensional mask image. The mask image is then projected onto a photocurable liquid resin surface and light is projected onto the resin to cure it in the shape of the layer. The technique has been used to create objects composed of multiple materials that cure at different rates. In research systems, the light is projected from below, allowing the resin to be quickly spread into uniform thin layers, reducing production time from hours to minutes. Commercially available devices such as Objet Connex apply the resin via small nozzles. Continuous liquid interface production (CLIP) is another form of additive manufacturing that uses the DLP based photo polymerization process to create smooth-sided solid objects of a wide variety of shapes. The continuous process of CLIP begins with a pool of liquid photopolymer resin. Part of the pool bottom is transparent to ultraviolet light (the "window"). Like DLP systems before it, ultraviolet light beam shines through the window, illuminating the precise cross-section of the object. The light causes the resin to solidify. The object rises slowly enough to allow resin to flow under and maintain contact with the bottom of the object. CLIP is different from traditional DLP processes, due to an oxygen-permeable membrane which lies below the resin, creating a "dead zone" (persistent liquid interface) preventing the resin from attaching to the window (photopolymerization is inhibited between the window and the polymerizer). In powder fed directed energy deposition a high power laser is used to melt metal powder supplied to the focus of the laser beam. The laser beam typically travels through the center of the deposition head and is focused to a small spot by one or more lenses. The build occurs on a X-Y table which is driven by a tool path created from a digital model to fabricate an object layer by layer. The deposition head is moved up vertically as each layer is completed. Metal powder is delivered and distributed around the circumference of the head or can be split by an internal manifold and delivered through nozzles arranged in various configurations around the deposition head. A hermetically sealed chamber filled with inert gas or a local inert shroud gas is often used to shield the melt pool from atmospheric oxygen for better control of material properties. The powder fed directed energy process is similar to Selective Laser Sintering, but the metal powder is applied only where material is being added to the part at that moment. The process supports a wide range of materials including titanium, stainless steel, aluminum, and other specialty materials as well as composites and functionally graded material. The process can not only fully build new metal parts but can also add material to existing parts for example for coatings, repair, and hybrid manufacturing applications. LENS (Laser Engineered Net Shaping), which was developed by Sandia National Labs, is one example of the Powder Fed - Directed Energy Deposition process for 3D printing or restoring metal parts. Laser-based wirefeed systems, such as Laser Metal Deposition-wire (LMD-w), feed wire through a nozzle that is melted by a laser using inert gas shielding in either an open environment (gas surrounding the laser), or in a sealed chamber. Electron beam freeform fabrication uses an electron beam heat source inside a vacuum chamber. It is also possible to use conventional gas metal arc welding attached to a 3D stage to 3-D print metals such as steel and aluminum. Low-cost open source RepRap-style 3-D printers have been outfitted with Arduino-based sensors and demonstrated reasonable metallurgical properties from conventional welding wire as feedstock. As of October 2012, additive manufacturing systems were on the market that ranged from $2,000 to $500,000 in price and were employed in industries including aerospace, architecture, automotive, defense, and medical replacements, among many others. For example, General Electric uses the high-end model to build parts for turbines. Many of these systems are used for rapid prototyping, before mass production methods are employed. Higher education has proven to be a major buyer of desktop and professional 3D printers which industry experts generally view as a positive indicator. Significant desktop 3D printer purchases by both K-12 and universities help sustain a desktop 3D printer market that has had problems in 2015-2016, while universities are filling a current talent gap that is expected to bolster the industry in years ahead. Libraries around the world have also become locations to house smaller 3D printers for educational and community access. Several projects and companies are making efforts to develop affordable 3D printers for home desktop use. Much of this work has been driven by and targeted at DIY/Maker/enthusiast/early adopter communities, with additional ties to the academic and hacker communities. RepRap Project is one of the longest running projects in the desktop category. The RepRap project aims to produce a free and open source hardware (FOSH) 3D printer, whose full specifications are released under the GNU General Public License, which is capable of replicating itself by printing many of its own (plastic) parts to create more machines. RepRaps have already been shown to be able to print circuit boards and metal parts. The most popular 3D printer in the world is the Prusa i3, a RepRap printer. Because of the FOSH aims of RepRap, many related projects have used their design for inspiration, creating an ecosystem of related or derivative 3D printers, most of which are also open source designs. The availability of these open source designs means that variants of 3D printers are easy to invent. The quality and complexity of printer designs, however, as well as the quality of kit or finished products, varies greatly from project to project. This rapid development of open source 3D printers is gaining interest in many spheres as it enables hyper-customization and the use of public domain designs to fabricate open source appropriate technology. This technology can also assist initiatives in sustainable development since technologies are easily and economically made from resources available to local communities. The cost of 3D printers has decreased dramatically since about 2010, with machines that used to cost $20,000 now costing less than $1,000. For instance, as of 2013, several companies and individuals are selling parts to build various RepRap designs, with prices starting at about €400 / US$500. The open source Fab@Home project has developed printers for general use with anything that can be squirted through a nozzle, from chocolate to silicone sealant and chemical reactants. Printers following the project's designs have been available from suppliers in kits or in pre-assembled form since 2012 at prices in the US$2000 range. The Kickstarter funded Peachy Printer is designed to cost $100 and several other new 3D printers are aimed at the small, inexpensive market including the mUVe3D and Lumifold. Rapide 3D has designed a professional grade crowdsourced 3D-printer costing $1499 which has no fumes nor constant rattle during use. The 3Doodler, "3D printing pen", raised $2.3 million on Kickstarter with the pens selling at $99, though the 3D Doodler has been criticized for being more of a crafting pen than a 3D printer. As the costs of 3D printers have come down they are becoming more appealing financially to use for self-manufacturing of personal products. In addition, 3D printing products at home may reduce the environmental impacts of manufacturing by reducing material use and distribution impacts. In addition, several RecycleBots such as the commercialized Filastruder have been designed and fabricated to convert waste plastic, such as shampoo containers and milk jugs, into inexpensive RepRap filament. There is some evidence that using this approach of distributed recycling is better for the environment. The development and hyper-customization of the RepRap-based 3D printers has produced a new category of printers suitable for small business and consumer use. Manufacturers such as Solidoodle, Robo 3D, RepRapPro and Pirx 3D have introduced models and kits priced at less than $1,000, thousands less than they were in September 2012. Depending on the application, the print resolution and speed of manufacturing lies somewhere between a personal printer and an industrial printer. A list of printers with pricing and other information is maintained. Most recently delta robots, like the TripodMaker, have been utilized for 3D printing to increase fabrication speed further. For delta 3D printers, due to its geometry and differentiation movements, the accuracy of the print depends on the position of the printer head. Some companies are also offering software for 3D printing, as a support for hardware manufactured by other companies. Large 3D printers have been developed for industrial, education, and demonstrative uses. A large delta-style 3D printer was built in 2014 by SeeMeCNC. The printer is capable of making an object with diameter of up to 4 feet (1.2 m) and up to 10 feet (3.0 m) in height. It also uses plastic pellets as the raw material instead of the typical plastic filaments used in other 3D printers. The BigRep One.1 with its 1 m³ volume. Another type of large printer is Big Area Additive Manufacturing (BAAM). The goal is to develop printers that can produce a large object in high speed. A BAAM machine of Cincinnati Incorporated can produce an object at the speeds 200-500 times faster than typical 3D printers available in 2014. Another BAAM machine is being developed by Lockheed Martin with an aim to print long objects of up to 100 feet (30 m) to be used in aerospace industries. Microelectronic device fabrication methods can be employed to perform the 3D printing of nanoscale-size objects. Such printed objects are typically grown on a solid substrate, e.g. silicon wafer, to which they adhere after printing as they are too small and fragile to be manipulated post-construction. 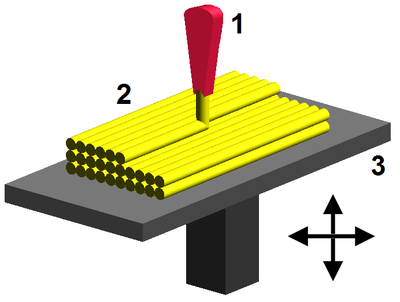 In one technique, 3D nanostructures can be printed by physically moving a dynamic stencil mask during the material deposition process, somewhat analogous to the extrusion method of traditional 3D printers. Programmable-height nanostructures with resolutions as small as 10 nm have been produced in this fashion, by metallic physical vapor deposition through a piezo-actuator controlled stencil mask having a milled nanopore in a silicon nitride membrane. Another method enhances the photopolymerization process on a much smaller scale, using finely-focused lasers controlled by adjustable mirrors. This method has produced objects with feature resolutions of 100 nm. Three-dimensional printing makes it as cheap to create single items as it is to produce thousands and thus undermines economies of scale. It may have as profound an impact on the world as the coming of the factory did....Just as nobody could have predicted the impact of the steam engine in 1750—or the printing press in 1450, or the transistor in 1950—it is impossible to foresee the long-term impact of 3D printing. But the technology is coming, and it is likely to disrupt every field it touches. AM technologies found applications starting in the 1980s in product development, data visualization, rapid prototyping, and specialized manufacturing. Their expansion into production (job production, mass production, and distributed manufacturing) has been under development in the decades since. Industrial production roles within the metalworking industries achieved significant scale for the first time in the early 2010s. Since the start of the 21st century there has been a large growth in the sales of AM machines, and their price has dropped substantially. According to Wohlers Associates, a consultancy, the market for 3D printers and services was worth $2.2 billion worldwide in 2012, up 29% from 2011. McKinsey predicts that additive manufacturing could have an economic impact of $550 billion annually by 2025. There are many applications for AM technologies, including architecture, construction (AEC), industrial design, automotive, aerospace, military, engineering, dental and medical industries, biotech (human tissue replacement), fashion, footwear, jewelry, eyewear, education, geographic information systems, food, and many other fields. Additive manufacturing's earliest applications have been on the toolroom end of the manufacturing spectrum. For example, rapid prototyping was one of the earliest additive variants, and its mission was to reduce the lead time and cost of developing prototypes of new parts and devices, which was earlier only done with subtractive toolroom methods such as cnc milling and turning, and precision grinding, far more accurate than 3d printing with accuracy down to 0.00005" and creating better quality parts faster, but sometimes too expensive for low accuracy prototype parts. With technological advances in additive manufacturing, however, and the dissemination of those advances into the business world, additive methods are moving ever further into the production end of manufacturing in creative and sometimes unexpected ways. Parts that were formerly the sole province of subtractive methods can now in some cases be made more profitably via additive ones. In addition, new developments in RepRap technology allow the same device to perform both additive and subtractive manufacturing by swapping magnetic-mounted tool heads. Additive manufacturing in combination with cloud computing technologies allows decentralized and geographically independent distributed production. Cloud-based additive manufacturing refers to a service-oriented networked manufacturing model in which service consumers are able to build parts through Infrastructure-as-a-Service (IaaS), Platform-as-a-Service (PaaS), Hardware-as-a-Service (HaaS), and Software-as-a-Service (SaaS). Distributed manufacturing as such is carried out by some enterprises; there is also a services like 3D Hubs that put people needing 3D printing in contact with owners of printers. Some companies offer on-line 3D printing services to both commercial and private customers, working from 3D designs uploaded to the company website. 3D-printed designs are either shipped to the customer or picked up from the service provider. 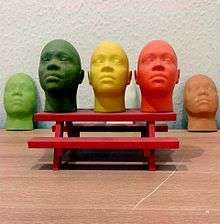 Companies have created services where consumers can customize objects using simplified web based customisation software, and order the resulting items as 3D printed unique objects. This now allows consumers to create custom cases for their mobile phones. Nokia has released the 3D designs for its case so that owners can customize their own case and have it 3D printed. Rapid manufacturing is a new method of manufacturing and many of its processes remain unproven. 3D printing is now entering the field of rapid manufacturing and was identified as a "next level" technology by many experts in a 2009 report. One of the most promising processes looks to be the adaptation of selective laser sintering (SLS), or direct metal laser sintering (DMLS) some of the better-established rapid prototyping methods. 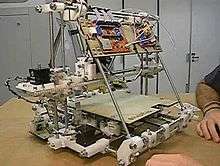 As of 2006, however, these techniques were still very much in their infancy, with many obstacles to be overcome before RM could be considered a realistic manufacturing method. 3D printing can be particularly useful in research labs due to its ability to make specialized, bespoke geometries. In 2012 a proof of principle project at the University of Glasgow, UK, showed that it is possible to use 3D printing techniques to assist in the production of chemical compounds. They first printed chemical reaction vessels, then used the printer to deposit reactants into them. They have produced new compounds to verify the validity of the process, but have not pursued anything with a particular application. Additive manufacturing of food is being developed by squeezing out food, layer by layer, into three-dimensional objects. A large variety of foods are appropriate candidates, such as chocolate and candy, and flat foods such as crackers, pasta, and pizza. NASA has considered the versatility of the concept, awarding a contract to the Systems and Materials Research Consultancy to study the feasibility of printing food in space. One of the problems with food printing is the nature of the texture of a food. For example, foods that are not strong enough to be filed are not appropriate for 3D printing. Professor Leroy Cronin of Glasgow University proposed in a 2012 TED Talk that it was possible to use chemical inks to print medicine. Similarly, 3D printing has been considered as a method of implanting stem cells capable of generating new tissues and organs in living humans. With their ability to transform into any other kind of cell in the human body, stem cells offer huge potential in 3D bio-printing. A printing based on fused filament fabrication (FFF) approach has been already implemented for the creation of microstructures having an internal 3D microstructure geometry. These objects can be produced without any sacrificial structures or additional support materials, just by precisely tuning the nozzle heating, fan cooling and translation velocity parameters. The manufactured microporous structures out of polylactic acid (PLA) can have fully controllable porosity (20%–60%). Such scaffolds could serve as biomedical templates for cell culturing, as well as biodegradable implants for tissue engineering. 3D printing has entered the world of clothing with fashion designers experimenting with 3D-printed bikinis, shoes, and dresses. In commercial production Nike is using 3D printing to prototype and manufacture the 2012 Vapor Laser Talon football shoe for players of American football, and New Balance is 3D manufacturing custom-fit shoes for athletes. 3D printing has come to the point where companies are printing consumer grade eyewear with on-demand custom fit and styling (although they cannot print the lenses). On-demand customization of glasses is possible with rapid prototyping. However, comment has been made in academic circles as to the potential limitation of the human acceptance of such mass customised apparel items due to the potential reduction of brand value communication. In the world of high fashion courtiers such as Karl Lagerfeld designing for Chanel, Iris van Herpen and Noa Raviv working with technology from Stratasys, have employed and featured 3d printing in their collections. Selections from theie lines and other working with 3d printing were showcased at the 2016 Metropolitan Museum of Art Anna Wintour Costume Center, exhibition "Manus X Machina". In early 2014, the Swedish supercar manufacturer, Koenigsegg, announced the One:1, a supercar that utilizes many components that were 3D printed. In the limited run of vehicles Koenigsegg produces, the One:1 has side-mirror internals, air ducts, titanium exhaust components, and complete turbocharger assemblies that were 3D printed as part of the manufacturing process. Urbee is the name of the first car in the world car mounted using the technology 3D printing (his bodywork and his car windows were "printed"). Created in 2010 through the partnership between the US engineering group Kor Ecologic and the company Stratasys (manufacturer of printers Stratasys 3D), it is a hybrid vehicle with futuristic look. In 2014, Local Motors debuted Strati, a functioning vehicle that was entirely 3D Printed using ABS plastic and carbon fiber, except the powertrain. In 2015, the company produced another iteration known as the LM3D Swim that was 80 percent 3D-printed. In 2016, the company has used 3D printing in the creation of automotive parts, such ones used in Olli, a self-driving vehicle developed by the company. In May 2015 Airbus announced that its new Airbus A350 XWB included over 1000 components manufactured by 3D printing. 3D printing is also being utilized by air forces to print spare parts for planes. In 2015, a Royal Air Force Eurofighter Typhoon fighter jet flew with printed parts. The United States Air Force has begun to work with 3D printers, and the Israeli Air Force has also purchased a 3D printer to print spare parts. The use of 3D printing to produce scale models within architecture and construction has steadily increased in popularity as the cost of 3D printers has reduced. This has enabled faster turn around of such scale models and allowed a steady increase in the speed of production and the complexity of the objects being produced. Construction 3D printing, the application of 3D printing to fabricate construction components or entire buildings has been in development since the mid 1990s, development of new technologies has steadily gained pace since 2012 and the sub-sector of 3D printing is beginning to mature. See main article. In 2012, the US-based group Defense Distributed disclosed plans to "[design] a working plastic gun that could be downloaded and reproduced by anybody with a 3D printer." Defense Distributed has also designed a 3D printable AR-15 type rifle lower receiver (capable of lasting more than 650 rounds) and a 30-round M16 magazine The AR-15 has multiple receivers (both an upper and lower receiver), but the legally controlled part is the one that is serialized (the lower, in the AR-15's case). Soon after Defense Distributed succeeded in designing the first working blueprint to produce a plastic gun with a 3D printer in May 2013, the United States Department of State demanded that they remove the instructions from their website. After Defense Distributed released their plans, questions were raised regarding the effects that 3D printing and widespread consumer-level CNC machining may have on gun control effectiveness. In 2014, a man from Japan became the first person in the world to be imprisoned for making 3D printed firearms. Yoshitomo Imura posted videos and blueprints of the gun online and was sentenced to jail for two years. Police found at least two guns in his household that were capable of firing bullets. 3D printing has been used to print patient specific implant and device for medical use. Successful operations include a titanium pelvis implanted into a British patient, titanium lower jaw transplanted to a Belgian patient, and a plastic tracheal splint for an American infant. The hearing aid and dental industries are expected to be the biggest area of future development using the custom 3D printing technology. In March 2014, surgeons in Swansea used 3D printed parts to rebuild the face of a motorcyclist who had been seriously injured in a road accident. Research is also being conducted on methods to bio-print replacements for lost tissue due to arthritis and cancer . 3D printing technology can now be used to make exact replicas of organs. The printer uses images from patients' MRI or CT scan images as a template and lays down layers of rubber or plastic. In October 24, 2014, a five-year-old girl born without fully formed fingers on her left hand became the first child in the UK to have a prosthetic hand made with 3D printing technology. Her hand was designed by US-based E-nable, an open source design organisation which uses a network of volunteers to design and make prosthetics mainly for children. The prosthetic hand was based on a plaster cast made by her parents. A boy named Alex was also born with a missing arm from just above the elbow. The team was able to use 3D printing to upload an e-NABLE Myoelectric arm that runs off of servos and batteries that are actuated by the electromyography muscle. With the use of 3D printers, E-NABLE has so far distributed more than 400 plastic hands to children. Printed prosthetics have been used in rehabilitation of crippled animals. In 2013, a 3D printed foot let a crippled duckling walk again. In 2014 a chihuahua born without front legs was fitted with a harness and wheels created with a 3D printer. 3D printed hermit crab shells let hermit crabs inhabit a new style home. A prosthetic beak was another tool developed by the use of 3D printing to help aid a bald eagle named Beauty, whose beak was severely mutilated from a shot in the face. Since 2014, commercially available titanium knee implants made with 3D printer for dogs have been used to restore the animal mobility. Over 10,000 dogs in Europe and United States have been treated after only one year. In February 2015, FDA approved the marketing of a surgical bolt which facilitates less-invasive foot surgery and eliminates the need to drill through bone. The 3D printed titanium device, 'FastForward Bone Tether Plate' is approved to use in correction surgery to treat bunion. In October 2015, the group of Professor Andreas Herrmann at the University of Groningen has developed the first 3D printable resins with antimicrobial properties. Employing stereolithography, quaternary ammonium groups are incorporated into dental appliances that kill bacteria on contact. This type of material can be further applied in medical devices and implants. In 2013, researchers at the University of Hasselt, in Belgium had successfully printed a new jawbone for an 83-year-old Belgian woman. 3D printing has been used to produce prosthetic beaks for eagles, a Brazilian goose named Victoria, and a Costa Rican toucan called Grecia. As of 2012, 3D bio-printing technology has been studied by biotechnology firms and academia for possible use in tissue engineering applications in which organs and body parts are built using inkjet techniques. In this process, layers of living cells are deposited onto a gel medium or sugar matrix and slowly built up to form three-dimensional structures including vascular systems. The first production system for 3D tissue printing was delivered in 2009, based on NovoGen bioprinting technology. Several terms have been used to refer to this field of research: organ printing, bio-printing, body part printing, and computer-aided tissue engineering, among others. The possibility of using 3D tissue printing to create soft tissue architectures for reconstructive surgery is also being explored. In 2013, Chinese scientists began printing ears, livers and kidneys, with living tissue. Researchers in China have been able to successfully print human organs using specialized 3D bio printers that use living cells instead of plastic . Researchers at Hangzhou Dianzi University designed the "3D bio printer" dubbed the "Regenovo". Xu Mingen, Regenovo's developer, said that it takes the printer under an hour to produce either a mini liver sample or a four to five inch ear cartilage sample. Xu also predicted that fully functional printed organs may be possible within the next ten to twenty years. The first pill manufactured by 3D printing was approved by the FDA in August 2015. Binder-jetting into a powder bed of the drug allows very porous pills to be produced, which enables high drug doses in a single pill which dissolves quickly and can be ingested easily. This has been demonstrated for Spritam, a reformulation of levetiracetam for the treatment of epilepsy. 3D printing can also be used to make laptops and other computers and cases. For example, Novena and VIA OpenBook standard laptop cases. I.e. a Novena motherboard can be bought and be used in a printed VIA OpenBook case. Open-source robots are built using 3D printers. Double Robotics grant access to their technology (an open SDK). On the other hand, 3&DBot is an Arduino 3D printer-robot with wheels and ODOI is a 3D printed humanoid robot. The Zero-G Printer, the first 3D printer designed to operate in zero gravity, was built under a joint partnership between NASA Marshall Space Flight Center (MSFC) and Made In Space, Inc. In September 2014, SpaceX delivered the zero-gravity 3D printer to the International Space Station (ISS). On December 19, 2014, NASA emailed CAD drawings for a socket wrench to astronauts aboard the ISS, who then printed the tool using its 3D printer. Applications for space offer the ability to print parts or tools on-site, as opposed to using rockets to bring along pre-manufactured items for space missions to human colonies on the moon, Mars, or elsewhere. The European Space Agency plans to deliver its new Portable On-Board 3D Printer (POP3D for short) to the International Space Station by June 2015, making it the second 3D printer in space. Furthermore, the Sinterhab project is researching a lunar base constructed by 3D printing using lunar regolith as a base material. Instead of adding a binding agent to the regolith, researchers are experimenting with microwave sintering to create solid blocks from the raw material. Similar researches and projects like these could allow faster construction for lower costs, and has been investigated for construction of off-Earth habitats. In 2005, a rapidly expanding hobbyist and home-use market was established with the inauguration of the open-source RepRap and Fab@Home projects. Virtually all home-use 3D printers released to-date have their technical roots in the ongoing RepRap Project and associated open-source software initiatives. In distributed manufacturing, one study has found that 3D printing could become a mass market product enabling consumers to save money associated with purchasing common household objects. For example, instead of going to a store to buy an object made in a factory by injection molding (such as a measuring cup or a funnel), a person might instead print it at home from a downloaded 3D model. In 2005, academic journals had begun to report on the possible artistic applications of 3D printing technology, being used by artists such as Martin John Callanan at The Bartlett school of architecture. By 2007 the mass media followed with an article in the Wall Street Journal and Time Magazine, listing a 3D printed design among their 100 most influential designs of the year. During the 2011 London Design Festival, an installation, curated by Murray Moss and focused on 3D Printing, was held in the Victoria and Albert Museum (the V&A). The installation was called Industrial Revolution 2.0: How the Material World will Newly Materialize. Some of the recent developments in 3D printing were revealed at the 3DPrintshow in London, which took place in November 2013 and 2014. The art section had in exposition artworks made with 3D printed plastic and metal. Several artists such as Joshua Harker, Davide Prete, Sophie Kahn, Helena Lukasova, Foteini Setaki showed how 3D printing can modify aesthetic and art processes. One part of the show focused on ways in which 3D printing can advance the medical field. The underlying theme of these advances was that these printers can be used to create parts that are printed with specifications to meet each individual. This makes the process safer and more efficient. One of these advances is the use of 3D printers to produce casts that are created to mimic the bones that they are supporting. These custom-fitted casts are open, which allow the wearer to scratch any itches and also wash the damaged area. Being open also allows for open ventilation. One of the best features is that they can be recycled to create more casts. 3D printing is becoming more popular in the customisable gifts industry, with products such as personalized mobile phone cases and dolls, as well as 3D printed chocolate. The use of 3D scanning technologies allows the replication of real objects without the use of moulding techniques that in many cases can be more expensive, more difficult, or too invasive to be performed, particularly for precious or delicate cultural heritage artifacts where direct contact with the moulding substances could harm the original object's surface. Critical making refers to the hands on productive activities that link digital technologies to society. It is invented to bridge the gap between creative physical and conceptual exploration. The term was popularized by Matt Ratto, an Assistant Professor and director of the Critical Making lab in the Faculty of Information at the University of Toronto. Ratto describes one of the main goals of critical as "to use material forms of engagement with technologies to supplement and extend critical reflection and, in doing so, to reconnect our lived experiences with technologies to social and conceptual critique". The main focus of critical making is open design, which includes, in addition to 3D printing technologies, also other digital software and hardware. People usually reference spectacular design when explaining critical making. Employing additive layer technology offered by 3D printing, Terahertz devices which act as waveguides, couplers and bends have been created. The complex shape of these devices could not be achieved using conventional fabrication techniques. Commercially available professional grade printer EDEN 260V was used to create structures with minimum feature size of 100 µm. The printed structures were later DC sputter coated with gold (or any other metal) to create a Terahertz Plasmonic Device. In 2016 artist/scientist Janine Carr Created the first 3d printed vocal percussion (beatbox) as a waveform, with the ability to play the soundwave by laser, along with four vocalised emotions these were also playable by laser. Some early consumer examples of 3d printing include the 64DD released in 1999 in Japan. As of 2012, domestic 3D printing was mainly practiced by hobbyists and enthusiasts. However, little was used for practical household applications, for example, ornamental objects. Some practical examples include a working clock and gears printed for home woodworking machines among other purposes. Web sites associated with home 3D printing tended to include backscratchers, coat hooks, door knobs, etc. The open source Fab@Home project has developed printers for general use. They have been used in research environments to produce chemical compounds with 3D printing technology, including new ones, initially without immediate application as proof of principle. The printer can print with anything that can be dispensed from a syringe as liquid or paste. The developers of the chemical application envisage both industrial and domestic use for this technology, including enabling users in remote locations to be able to produce their own medicine or household chemicals. 3D printing is now working its way into households, and more and more children are being introduced to the concept of 3D printing at earlier ages. The prospects of 3D printing are growing, and as more people have access to this new innovation, new uses in households will emerge. The OpenReflex SLR film camera was developed for 3D printing as an open-source student project. 3D printing, and open source 3D printers in particular, are the latest technology making inroads into the classroom. 3D printing allows students to create prototypes of items without the use of expensive tooling required in subtractive methods. Students design and produce actual models they can hold. The classroom environment allows students to learn and employ new applications for 3D printing. RepRaps, for example, have already been used for an educational mobile robotics platform. Some authors have claimed that 3D printers offer an unprecedented "revolution" in STEM education. The evidence for such claims comes from both the low cost ability for rapid prototyping in the classroom by students, but also the fabrication of low-cost high-quality scientific equipment from open hardware designs forming open-source labs. Engineering and design principles are explored as well as architectural planning. Students recreate duplicates of museum items such as fossils and historical artifacts for study in the classroom without possibly damaging sensitive collections. Other students interested in graphic designing can construct models with complex working parts easily. 3D printing gives students a new perspective with topographic maps. Science students can study cross-sections of internal organs of the human body and other biological specimens. And chemistry students can explore 3D models of molecules and the relationship within chemical compounds. According to a recent paper by Kostakis et al., 3D printing and design can electrify various literacies and creative capacities of children in accordance with the spirit of the interconnected, information-based world. Future applications for 3D printing might include creating open-source scientific equipment. In Bahrain, large-scale 3D printing using a sandstone-like material has been used to create unique coral-shaped structures, which encourage coral polyps to colonize and regenerate damaged reefs. These structures have a much more natural shape than other structures used to create artificial reefs, and, unlike concrete, are neither acid nor alkaline with neutral pH. In the last several years 3D printing has been intensively used by in the cultural heritage field for preservation, restoration and dissemination purposes. Many Europeans and North American Museums have purchased 3D printers and actively recreate missing pieces of their relics. The Metropolitan Museum of Art and the British Museum have started using their 3D printers to create museum souvenirs that are available in the museum shops. Other museums, like the National Museum of Military History and Varna Historical Museum, have gone further and sell through the online platform Threeding digital models of their artifacts, created using Artec 3D scanners, in 3D printing friendly file format, which everyone can 3D print at home. Consumer grade 3D printing has resulted in new materials that have been developed specifically for 3D printers. For example, filament materials have been developed to imitate wood in its appearance as well as its texture. Furthermore, new technologies, such as infusing carbon fiber into printable plastics, allowing for a stronger, lighter material. In addition to new structural materials that have been developed due to 3D printing, new technologies have allowed for patterns to be applied directly to 3D printed parts. Iron oxide-free Portland cement powder has been used to create architectural structures up to 9 feet in height. 3D printers have been noted to be an environmental hazard due to them emitting microscopic particles and chemicals that have been linked to asthma. A National Institute for Occupational Safety and Health (NIOSH) report notes these emissions peaked a few minutes after printing started and returned to baseline levels 100 minutes after printing ended. The problem was reduced by using manufacturer-supplied covers and full enclosures, using proper ventilation, keeping workers away from the printer while wearing respirators, turning off the printer if it jammed, and using lower emission printers and filaments. Since the 1950s, a number of writers and social commentators have speculated in some depth about the social and cultural changes that might result from the advent of commercially affordable additive manufacturing technology. Amongst the more notable ideas to have emerged from these inquiries has been the suggestion that, as more and more 3D printers start to enter people's homes, so the conventional relationship between the home and the workplace might get further eroded. Likewise, it has also been suggested that, as it becomes easier for businesses to transmit designs for new objects around the globe, so the need for high-speed freight services might also become less. Finally, given the ease with which certain objects can now be replicated, it remains to be seen whether changes will be made to current copyright legislation so as to protect intellectual property rights with the new technology widely available. As 3D printers became more accessible to consumers, online social platforms have developed to support the community. This includes websites that allow users to access information such as how to build a 3D printer, as well as social forums that discuss how to improve 3D print quality and discuss 3D printing news, as well as social media websites that are dedicated to share 3D models. RepRap is a wiki based website that was created to hold all information on 3d printing, and has developed into a community that aims to bring 3D printing to everyone. Furthermore, there are other sites such as Pinshape, Thingiverse and MyMiniFactory, which was created initially to allow users to post 3D files for anyone to print, allowing for decreased transaction cost of sharing 3D files. These websites have allowed for greater social interaction between users, creating communities dedicated around 3D printing. Some call attention to the conjunction of Commons-based peer production with 3D printing and other low-cost manufacturing techniques. The self-reinforced fantasy of a system of eternal growth can be overcome with the development of economies of scope, and here, the civil society can play an important role contributing to the raising of the whole productive structure to a higher plateau of more sustainable and customized productivity. Further, it is true that many issues, problems and threats rise due to the large democratization of the means of production, and especially regarding the physical ones. For instance, the recyclability of advanced nanomaterials is still questioned; weapons manufacturing could become easier; not to mention the implications on counterfeiting and on IP. It might be maintained that in contrast to the industrial paradigm whose competitive dynamics were about economies of scale, Commons-based peer production and 3D printing could develop economies of scope. While the advantages of scale rest on cheap global transportation, the economies of scope share infrastructure costs (intangible and tangible productive resources), taking advantage of the capabilities of the fabrication tools. And following Neil Gershenfeld in that "some of the least developed parts of the world need some of the most advanced technologies", Commons-based peer production and 3D printing may offer the necessary tools for thinking globally but act locally in response to certain problems and needs. Forbes investment pundits have predicted that 3D printing may lead to a resurgence of American Manufacturing, citing the small, creative companies that comprise the current industry landscape, and the lack of the necessary complex infrastructure in typical outsource markets. ↑ Excell, Jon. "The rise of additive manufacturing". The Engineer. Retrieved 2013-10-30. ↑ "3D Printer Technology – Animation of layering". Create It Real. Retrieved 2012-01-31. ↑ "Jeremy Rifkin and The Third Industrial Revolution Home Page". Thethirdindustrialrevolution.com. Retrieved 2016-01-04. ↑ "A third industrial revolution". The Economist. 2012-04-21. Retrieved 2016-01-04. 1 2 3 Jane Bird (2012-08-08). "Exploring the 3D printing opportunity". The Financial Times. Retrieved 2012-08-30. ↑ Jean-Claude, Andre. "Disdpositif pour realiser un modele de piece industrielle". National De La Propriete Industrielle. ↑ Mendoza, Hannah Rose (2015-05-15). "Alain Le Méhauté, The Man Who Submitted Patent For SLA 3D Printing Before Chuck Hull". 3dprint.com. ↑ Moussion, Alexandre (2014). "Interview d'Alain Le Méhauté, l'un des pères de l'impression 3D". Primante 3D. ↑ "3D Printing: What You Need to Know". PCMag.com. Retrieved 2013-10-30. ↑ Freedman, David H (2012). "Layer By Layer". Technology Review. 115 (1): 50–53. ↑ Amon, C. H.; Beuth, J. L.; Weiss, L. E.; Merz, R.; Prinz, F. B. (1998). "Shape Deposition Manufacturing With Microcasting: Processing, Thermal and Mechanical Issues" (PDF). Journal of Manufacturing Science and Engineering. 120 (3). Retrieved 2014-12-20. ↑ Beck, J.E. ; Fritz, B.; Siewiorek, Daniel; Weiss, Lee (1992). "Manufacturing Mechatronics Using Thermal Spray Shape Deposition" (PDF). Proceedings of the 1992 Solid Freeform Fabrication Symposium. Retrieved 2014-12-20. ↑ Prinz, F. B.; Merz, R.; Weiss, Lee (1997). Ikawa, N., ed. Building Parts You Could Not Build Before. Proceedings of the 8th International Conference on Production Engineering. 2-6 Boundary Row, London SE1 8HN, UK: Chapman & Hall. pp. 40–44. ↑ "Google Ngram of the term additive manufacturing". 1 2 Pearce, Joshua M.; et al. (2010). "3-D Printing of Open Source Appropriate Technologies for Self-Directed Sustainable Development". Journal of Sustainable Development. 3 (4): 17–29. doi:10.5539/jsd.v3n4p17. Retrieved 2012-01-31. 1 2 "3D Printing". 13 February 2012. ↑ Ishengoma, Fredrick R.; Mtaho, Adam B. (2014-10-18). "3D Printing: Developing Countries Perspectives". International Journal of Computer Applications. 104 (11): 30–34. arXiv:1410.5349 . doi:10.5120/18249-9329. ISSN 0975-8887. 1 2 Jacobs, Paul Francis (1992-01-01). Rapid Prototyping & Manufacturing: Fundamentals of Stereolithography. Society of Manufacturing Engineers. ISBN 978-0-87263-425-1. ↑ "3D solid repair software – Fix STL polygon mesh files – LimitState:FIX". Print.limitstate.com. Retrieved 2016-01-04. ↑ "3D Printing Pens". yellowgurl.com. Retrieved 2016-08-09. ↑ "Model Repair Service". Modelrepair.azurewebsites.net. Retrieved 2016-01-04. ↑ "Magics, the Most Powerful 3D Printing Software | Software for additive manufacturing". Software.materialise.com. Retrieved 2016-01-04. ↑ "netfabb Cloud Services". Netfabb.com. 2009-05-15. Retrieved 2016-01-04. ↑ "How to repair a 3D scan for printing". Anamarva.com. Retrieved 2016-01-04. ↑ Fausto Bernardini, Holly E. Rushmeier (2002). "The 3D Model Acquisition Pipeline GAS" (PDF). Comput. Graph. Forum. 21 (2): 149–172. doi:10.1111/1467-8659.00574. ↑ "cord or cordless 3D printing pen". tutorial45. Retrieved 3 June 2016. ↑ "Objet Connex 3D Printers". Objet Printer Solutions. Retrieved 2012-01-31. ↑ "How to 3D-print super-fast and have an awesome finishing". 3dprinterchat. Retrieved 5 May 2016. ↑ "How to Smooth 3D-Printed Parts". ↑ Kraft, Caleb. "Smoothing Out Your 3D Prints With Acetone Vapor". Make. Make. Retrieved 2016-01-05. ↑ Haselhuhn, Amberlee S.; Wijnen, Bas; Anzalone, Gerald C.; Sanders, Paul G.; Pearce, Joshua M. (2015). "In Situ Formation of Substrate Release Mechanisms for Gas Metal Arc Weld Metal 3-D Printing". Journal of Materials Processing Technology. 226: 50–59. doi:10.1016/j.jmatprotec.2015.06.038. ↑ Sames, W. "The metallurgy and processing science of metal additive manufacturing". International Materials Reviews. 61: 315–360. doi:10.1080/09506608.2015.1116649. ↑ FDM is a proprietary term owned by Stratasys. All 3-D printers that are not Stratasys machines and use a fused filament process are referred to as or fused filament fabrication (FFF). ↑ Sherman, Lilli Manolis (November 15, 2007). "A whole new dimension – Rich homes can afford 3D printers". The Economist. ↑ Wohlers, Terry. "Factors to Consider When Choosing a 3D Printer (WohlersAssociates.com, Nov/Dec 2005)". ↑ www.3ders.org (2012-09-25). "Casting aluminum parts directly from 3D printed PLA parts". 3ders.org. Retrieved 2013-10-30. ↑ "Affordable 3D Printing with new Selective Heat Sintering (SHS™) technology". blueprinter. ↑ Chee Kai Chua; Kah Fai Leong; Chu Sing Lim (2003). Rapid Prototyping. World Scientific. p. 124. ISBN 978-981-238-117-0. ↑ "PTFE Tubing Benefits & Applications". Fluorotherm Polymers, Inc. Retrieved 17 November 2015. ↑ "Aluminum-powder DMLS-printed part finishes race first". ↑ "Selective Laser Sintering, Birth of an Industry". ↑ Deckard, C., "Method and apparatus for producing parts by selective sintering", U.S. Patent 4,863,538, filed October 17, 1986, published September 5, 1989. ↑ Housholder, R., "Molding Process", U.S. Patent 4,247,508, filed December 3, 1979, published January 27, 1981. ↑ Hiemenz, Joe. "Rapid prototypes move to metal components (EE Times, 3/9/2007)". ↑ "Rapid Manufacturing by Electron Beam Melting". SMU.edu. ↑ "3D Printer Uses Standard Paper". ↑ François Willème (May 15, 1861) "La sculpture photographique", Le Moniteur de la photographie, p. 34. ↑ Johnson, R. Colin. "Cheaper avenue to 65 nm? (EE Times, 3/30/2007)". ↑ "The World's Smallest 3D Printer". TU Wien. 12 September 2011. 1 2 3 4 "3D-printing multi-material objects in minutes instead of hours". Kurzweil Accelerating Intelligence. November 22, 2013. 1 2 St. Fleur, Nicholas (17 March 2015). "3-D Printing Just Got 100 Times Faster". The Atlantic. Retrieved 19 March 2015. 1 2 Castelvecchi, Davide (17 March 2015). "Chemical trick speeds up 3D printing". Nature. Retrieved 19 March 2015. ↑ Saxena, Shalini (19 March 2015). "New nonstop 3D printing process takes only minutes instead of hours". Ars Technica. Retrieved 19 March 2015. ↑ Beese, Allison M.; Carroll, Beth E. (2015-12-21). "Review of Mechanical Properties of Ti-6Al-4V Made by Laser-Based Additive Manufacturing Using Powder Feedstock". JOM. 68 (3): 724–734. doi:10.1007/s11837-015-1759-z. ISSN 1047-4838. ↑ Gibson, Ian; Rosen, David; Stucker, Brent. "Chapter 10". Additive Manufacturing Technologies - Springer. doi:10.1007/978-1-4939-2113-3. ↑ Yuenyong Nilsiam, Amberlee Haselhuhn, Bas Wijnen, Paul Sanders, & Joshua M. Pearce. Integrated Voltage – Current Monitoring and Control of Gas Metal Arc Weld Magnetic Ball-Jointed Open Source 3-D Printer. Machines 3(4), 339-351 (2015). ↑ A. Pinar, B. Wijnen, G. C. Anzalone, T. C. Havens, P. G. Sanders, J. M. Pearce. Low-cost Open-Source Voltage and Current Monitor for Gas Metal Arc Weld 3-D Printing. Journal of Sensors Vol. 2015, Article ID 876714, 8 pages, 2015. 1 2 3 "3D Printing: Challenges and Opportunities for International Relations". Council on Foreign Relations. October 23, 2013. Retrieved 2013-10-30. ↑ "Despite Market Woes, 3D Printing Has a Future Thanks to Higher Education - Bold". 2 December 2015. ↑ "Stratasys Ltd. Short Interest Update". Americantradejournal.com. ↑ "First MakerBot 3D Printing Innovation Center in the Midwest opens at Xavier". ↑ "UMass Amherst Library Opens 3-D Printing Innovation Center". ↑ Kalish, Jon. "A Space For DIY People To Do Their Business (NPR.org, November 28, 2010)". Retrieved 2012-01-31. ↑ Jones, R.; Haufe, P.; Sells, E.; Iravani, P.; Olliver, V.; Palmer, C.; Bowyer, A. (2011). "Reprap-- the replicating rapid prototyper". Robotica. 29 (1): 177–191. doi:10.1017/s026357471000069x. ↑ "Open source 3D printer copies itself". Computerworld New Zealand. 2008-04-07. Retrieved 2013-10-30. ↑ "First reprapped circuit". RepRap. ↑ "An Inexpensive Way to Print Out Metal Parts". The New York Times. 10 December 2013. ↑ Anzalone, Gerald C.; Zhang, Chenlong; Wijnen, Bas; Sanders, Paul G.; Pearce, Joshua M. (2013). "Low-Cost Open-Source 3-D Metal Printing". IEEE Access. 1: 803–810. doi:10.1109/ACCESS.2013.2293018. ↑ "3D Printing Trends July 2016". 3D Hubs. Retrieved 2016-07-12. ↑ "What's up with Original Prusa i3? - Prusa Printers". 2016-03-02. Retrieved 2016-07-12. ↑ Bilton, Nick. "Disruptions: On the Fast Track to Routine 3-D Printing". 1 2 3 www.3ders.org. "3D printers list with prices". 3ders.org. Retrieved 2013-10-30. 1 2 Simonite, Tom. "Desktop fabricator may kick-start home revolution". ↑ "3D printer by Saskatchewan man gets record crowdsourced cash". Saskatchewan: CBC News. 6 November 2013. Retrieved 8 November 2013. ↑ "Rapide One – Affordable Professional Desktop 3D Printer by Rapide 3D". Indiegogo. December 2, 2013. Retrieved 20 January 2014. ↑ "A Review Of The 3Doodler Pen, Which Raised Over $2 Million On Kickstarter". ↑ Dorrier, Jason (27 February 2013). "Kickstarter 3Doodler 3D Printing Pen Nothing of the Sort - But Somehow Raises $2 Million". 1 2 Wittbrodt, B. T.; Glover, A. G.; Laureto, J.; Anzalone, G. C.; Oppliger, D.; Irwin, J. L.; Pearce, J. M. (2013). "Life-cycle economic analysis of distributed manufacturing with open-source 3-D printers". Mechatronics. 23 (6): 713–726. doi:10.1016/j.mechatronics.2013.06.002. ↑ Kreiger, M.; Pearce, J. M. (2013). "Environmental Life Cycle Analysis of Distributed Three-Dimensional Printing and Conventional Manufacturing of Polymer Products". ACS Sustainable Chemistry & Engineering. 1: 131002082320002. doi:10.1021/sc400093k. ↑ Baechler, Christian; DeVuono, Matthew; Pearce, Joshua M. (2013). "Distributed Recycling of Waste Polymer into RepRap Feedstock". Rapid Prototyping Journal. 19 (2): 118–125. doi:10.1108/13552541311302978. ↑ "Distributed Recycling of Post-Consumer Plastic Waste in Rural Areas". ↑ "Rostock (delta robot 3D printer) by Johann". Thingiverse.com. ↑ Vandendriessche, Pieter-Jan. "delta 3D printer accuracy". ↑ Titsch, Mike (July 11, 2013). "MatterHackers Opens 3D Printing Store and Releases MatterControl 0.7.6". Retrieved November 30, 2013. ↑ "Hoosier Daddy – The Largest Delta 3D Printer In the World". 3D Printer World. Punchbowl Media. 2014-09-23. Retrieved 2014-09-28. ↑ McKenna, Beth (2014-09-26). "The Next Big Thing in 3-D Printing: Big Area Additive Manufacturing, or BAAM". The Motley Fool. Retrieved 2014-09-28. ↑ J. L. Wasserman; et al. (2008). "Fabrication of One-Dimensional Programmable-Height Nanostructures via Dynamic Stencil Deposition". Review of Scientific Instruments. 79 (7): 073909. arXiv:0802.1848 . doi:10.1063/1.2960573. ↑ patel, Prachi (5 March 2013). "Micro 3-D Printer Creates Tiny Structures in Seconds". MIT Technology Review. ↑ "Print me a Stradivarius – How a new manufacturing technology will change the world". Economist Technology. 2011-02-10. Retrieved 2012-01-31. ↑ Zelinski, Peter (2014-06-25). "Video: World's largest additive metal manufacturing plant". Modern Machine Shop. ↑ Sherman, Lilli Manolis. "3D Printers Lead Growth of Rapid Prototyping (Plastics Technology, August 2004)". Retrieved 2012-01-31. ↑ "3D printing: 3D printing scales up". The Economist. 2013-09-07. Retrieved 2013-10-30. ↑ "A printed smile". The Economist. ISSN 0013-0613. Retrieved 2016-05-08. ↑ "Development of a Three-Dimensional Printed, Liquid-Cooled Nozzle for a Hybrid Rocket Motor," Nick Quigley and James Evans Lyne, Journal of Propulsion and Power, Vol. 30, No. 6 (2014), pp. 1726–1727. ↑ Anzalone, G.; Wijnen, B.; Pearce, Joshua M. (2015). "Multi-material additive and subtractive prosumer digital fabrication with a free and open-source convertible delta RepRap 3-D printer". Rapid Prototyping Journal. 21 (5): 506–519. doi:10.1108/RPJ-09-2014-0113. ↑ Felix Bopp (2010). Future Business Models by Additive Manufacturing. Verlag. ISBN 3-8366-8508-6. Retrieved 4 July 2014. ↑ Wu, D.; Thames, J.L. ; Rosen, D.W.; Schaefer, D. (2013). "Enhancing the Product Realization Process with Cloud-Based Design and Manufacturing Systems." Transactions of the ASME". Journal of Computing and Information Science in Engineering. 13 (4): 041004. doi:10.1115/1.4025257. ↑ Wu, D.; Rosen, D.W.; Wang, L.; Schaefer, D. (2015). "Cloud-Based Design and Manufacturing: A New Paradigm in Digital Manufacturing and Design Innovation". Computer-Aided Design. 59 (1): 1–14. doi:10.1016/j.cad.2014.07.006. ↑ Wu, D.; Rosen, D.W.; Schaefer, D. (2015). "Scalability Planning for Cloud-Based Manufacturing Systems." Transactions of the ASME". Journal of Manufacturing Science and Engineering. 137: 040911. doi:10.1115/1.4030266. ↑ "3D Hubs: Like Airbnb For 3D Printers". gizmodo. Retrieved 2014-07-05. ↑ Sterling, Bruce (2011-06-27). "Spime Watch: Dassault Systèmes' 3DVIA and Sculpteo (Reuters, June 27, 2011)". Wired. Archived from the original on 15 April 2014. Retrieved 2012-01-31. ↑ Vance, Ashlee (2011-01-12). "The Wow Factor of 3-D Printing (The New York Times, January 12, 2011)". Retrieved 2012-01-31. ↑ "The action doll you designed, made real". makie.me. Retrieved January 18, 2013. ↑ "Cubify — Express Yourself in 3D". myrobotnation.com. Retrieved 2014-01-25. ↑ "Turn Your Baby's Cry Into an iPhone Case". Bloomberg Businessweek. 2012-03-10. Retrieved 2013-02-20. ↑ "Nokia backs 3D printing for mobile phone cases". BBC News Online. 2013-02-18. Retrieved 2013-02-20. 1 2 3 Symes, M. D.; Kitson, P. J.; Yan, J.; Richmond, C. J.; Cooper, G. J. T.; Bowman, R. W.; Vilbrandt, T.; Cronin, L. (2012). "Integrated 3D-printed reactionware for chemical synthesis and analysis". Nature Chemistry. 4 (5): 349–354. doi:10.1038/nchem.1313. PMID 22522253. ↑ Wong, Venessa. "A Guide to All the Food That's Fit to 3D Print (So Far)". Bloomberg.com. ↑ "Did BeeHex Just Hit 'Print' to Make Pizza at Home?". Retrieved 28 May 2016. ↑ "Foodini 3D Printer Cooks Up Meals Like the Star Trek Food Replicator". Retrieved 27 January 2015. ↑ "3D Printing: Food in Space". NASA. Retrieved 2015-09-30. ↑ "Print your own medicine". ↑ "RFA-HD-15-023: Use of 3-D Printers for the Production of Medical Devices (R43/R44)". NIH grants. Retrieved 2015-09-30. ↑ "7 Ways 3D Printing Is Disrupting The Medical Industry". 3D Masterminds. ↑ "3D Microporous Scaffolds Manufactured via Combination of Fused Filament Fabrication and Direct Laser Writing Ablation". MDPI. Retrieved 2016-08-24. 1 2 "3D Printed Clothing Becoming a Reality". Resins Online. 2013-06-17. Retrieved 2013-10-30. ↑ Michael Fitzgerald (2013-05-28). "With 3-D Printing, the Shoe Really Fits". MIT Sloan Management Review. Retrieved 2013-10-30. ↑ Sharma, Rakesh (2013-09-10). "3D Custom Eyewear The Next Focal Point For 3D Printing". Forbes.com. Retrieved 2013-09-10. ↑ Parker C. J. (2015). The Human Acceptance of 3D Printing in Fashion Paradox: Is mass customisation a bridge too far? IWAMA 2015: 5th International Workshop of Advanced Manufacturing and Automation. Shanghai, China. ↑ "Karl Lagerfeld Showcases 3D Printed Chanel at Paris Fashion Week". ↑ "Noa Raviv uses grid patterns and 3D printing in fashion collection". 21 August 2014. ↑ Holgate, Mark. "Meet Iris van Herpen, the Dutch Designer Boldly Going Into the Future". ↑ "Koenigsegg One:1 Comes With 3D Printed Parts". Business Insider. Retrieved 2014-05-14. ↑ Eternity, Max. "The Urbee 3D-Printed Car: Coast to Coast on 10 Gallons?". ↑ "Local Motors shows Strati, the world's first 3D-printed car". 13 January 2015. ↑ Walker, Daniela. "Local Motors wants to 3D-print your next car out of plastic". ↑ Warren, Tamara (16 June 2016). "This autonomous, 3D-printed bus starts giving rides in Washington, DC today". ↑ "Building Olli: Why "Second-degree DDM" is critical to the process - Local Motors". 24 June 2016. ↑ Simmons, Dan (2015-05-06). "Airbus had 1,000 parts 3D printed to meet deadline". BBC. Retrieved 2015-11-27. ↑ Zitun, Yoav (2015-07-27). "The 3D printer revolution comes to the IAF". Ynet News. Retrieved 2015-09-29. ↑ "Blueprints for 3-D printer gun pulled off website". statesman.com. May 2013. Retrieved 2013-10-30. ↑ Samsel, Aaron. "3D Printers, Meet Othermill: A CNC machine for your home office (VIDEO)". Guns.com. Retrieved 2013-10-30. ↑ "The Third Wave, CNC, Stereolithography, and the end of gun control". Popehat. Retrieved 2013-10-30. ↑ Rosenwald, Michael S. (2013-02-25). "Weapons made with 3-D printers could test gun-control efforts". Washington Post. ↑ "Making guns at home: Ready, print, fire". The Economist. 2013-02-16. Retrieved 2013-10-30. ↑ Rayner, Alex (6 May 2013). "3D-printable guns are just the start, says Cody Wilson". The Guardian. London. ↑ Manjoo, Farhad (2013-05-08). "3-D-printed gun: Yes, it will be possible to make weapons with 3-D printers. No, that doesn't make gun control futile". Slate.com. Retrieved 2013-10-30. 1 2 Franzen, Carl. "3D-printed gun maker in Japan sentenced to two years in prison". The Verge. ↑ "Transplant jaw made by 3D printer claimed as first". BBC. 2012-02-06. ↑ Rob Stein (2013-03-17). "Doctors Use 3-D Printing To Help A Baby Breathe". NPR. ↑ Moore, Calen (11 February 2014). "Surgeons have implanted a 3-D-printed pelvis into a U.K. cancer patient". fiercemedicaldevices.com. Retrieved 2014-03-04. ↑ Keith Perry (2014-03-12). "Man makes surgical history after having his shattered face rebuilt using 3D printed parts". London: The Daily Telegraph. Retrieved 2014-03-12. ↑ BBC News (October 2014). "Inverness girl Hayley Fraser gets 3D-printed hand", BBC News, 2014-10-01. Retrieved 2014-10-02. ↑ "3D-Printed Foot Lets Crippled Duck Walk Again". ↑ Pleasance, Chris (18 August 2014). "Puppy power: Chihuahua born without front legs is given turbo-charged makeover after being fitted with 3D printed body harness and a set of skateboard wheels". The Daily Mail. Retrieved 2014-08-21. ↑ Flaherty, Joseph (2013-07-30). "So Cute: Hermit Crabs Strut in Stylish 3-D Printed Shells". Wired. ↑ "3D Systems preps for global launch of 'printed' knee implants for dogs". FierceAnimalHealth.com. Retrieved 13 April 2015. ↑ Saxena, Varun. "FDA clears 3-D printed device for minimally invasive foot surgery". FierceMedicalDevices.com. Retrieved 14 April 2015. ↑ Yue, J; Zhao, P; Gerasimov, JY; de Lagemaat, M; Grotenhuis, A; Rustema-Abbing, M; van der Mei, HC; Busscher, HJ; Herrmann, A; Ren, Y (2015). "3D-Printable Antimicrobial Composite Resins". Adv. Funct. Mater. 25 (43): 6756–6767. doi:10.1002/adfm.201502384. ↑ "Mish's Global Economic Trend Analysis: 3D-Printing Spare Human Parts; Ears and Jaws Already, Livers Coming Up ; Need an Organ? Just Print It". Globaleconomicanalysis.blogspot.co.uk. 2013-08-18. Retrieved 2013-10-30. ↑ Aias, L (11 Aug 2016). "Grecia, the toucan with the prosthetic beak, now receiving visitors". The Tico Times. Retrieved 14 Sep 2016. ↑ "3D-printed sugar network to help grow artificial liver". BBC News. ↑ "Invetech helps bring bio-printers to life". Australian Life Scientist. Westwick-Farrow Media. December 11, 2009. Retrieved December 31, 2013. ↑ "Building body parts with 3D printing". ↑ Silverstein, Jonathan. "'Organ Printing' Could Drastically Change Medicine (ABC News, 2006)". Retrieved 2012-01-31. ↑ "Engineering Ourselves – The Future Potential Power of 3D-Bioprinting?". ENGINEERING.com. ↑ The Diplomat (2013-08-15). "Chinese Scientists Are 3D Printing Ears and Livers – With Living Tissue". Tech Biz. The Diplomat. Retrieved 2013-10-30. ↑ "How do they 3D print kidney in China". Retrieved 2013-10-30. ↑ Palmer, Eric (3 August 2015). "Company builds plant for 3DP pill making as it nails first FDA approval". fiercepharmamanufacturing.com. Retrieved 4 August 2015. ↑ Kuehn, Steven E. (September 2015). "I'm Printing Your Prescription Now, Ma'am". From the Editor. Pharmaceutical Manufacturing (paper). Putnam Media: 7. ↑ "The Almost Completely Open Source Laptop Goes on Sale". ↑ McCue, TJ. "Robots And 3D Printing". ↑ "A lesson in building a custom 3D printed humanoid robot". ↑ "New horizons open with space-based 3D printing". SPIE Newsroom. Retrieved 1 April 2015. ↑ Hays, Brooks (2014-12-19). "NASA just emailed the space station a new socket wrench". Retrieved 2014-12-20. ↑ Brabaw, Kasandra (2015-01-30). "Europe's 1st Zero-Gravity 3D Printer Headed for Space". Retrieved 2015-02-01. ↑ Wood, Anthony (2014-11-17). "POP3D to be Europe's first 3D printer in space". Retrieved 2015-02-01. ↑ Raval, Siddharth (2013-03-29). "SinterHab: A Moon Base Concept from Sintered 3D-Printed Lunar Dust". Space Safety Magazine. Retrieved 2013-10-15. ↑ "The World's First 3D-Printed Building Will Arrive In 2014". TechCrunch. 2012-01-20. Retrieved 2013-02-08. ↑ Diaz, Jesus (2013-01-31). "This Is What the First Lunar Base Could Really Look Like". Gizmodo. Retrieved 2013-02-01. ↑ Kelly, Heather (July 31, 2013). "Study: At-home 3D printing could save consumers "thousands"". CNN. ↑ Séquin, C. H. (2005). "Rapid prototyping". Communications of the ACM. 48 (6): 66. doi:10.1145/1064830.1064860. ↑ Guth, Robert A. "How 3-D Printing Figures To Turn Web Worlds Real (The Wall Street Journal, December 12, 2007)" (PDF). Retrieved 2012-01-31. ↑ iPad iPhone Android TIME TV Populist The Page (2008-04-03). "Bathsheba Grossman's Quin.MGX for Materialise". Time. Retrieved 2013-10-30. ↑ Williams, Holly (2011-08-28). "Object lesson: How the world of decorative art is being revolutionised by 3D printing (The Independent, 28 August 2011)". London. Retrieved 2012-01-31. ↑ Bennett, Neil (November 13, 2013). "How 3D printing is helping doctors mend you better". TechAdvisor. ↑ "Custom Bobbleheads". Retrieved 13 January 2015. ↑ "3D-print your face in chocolate for that special Valentine's Day gift". The Guardian. 25 January 2013. ↑ Cignoni, P.; Scopigno, R. (2008). "Sampled 3D models for CH applications". Journal on Computing and Cultural Heritage. 1: 1–23. doi:10.1145/1367080.1367082. ↑ DiSalvo, C (2009). "Design and the Construction of Publics". Design Issues. 1. 25: 48–63. doi:10.1162/desi.2009.25.1.48. ↑ Ratto, M. & Ree, R. (2012). "Materializing information: 3D printing and social change.". First Monday. 17 (7). doi:10.5210/fm.v17i7.3968. ↑ Ratto, Matt (2011). "Open Design and Critical Making". Open Design Now: Why Design Cannot Remain Exclusive. ↑ Lukens, Jonathan. "Speculative Design and Technological Fluency". International Journal of Learning and Media. 3: 23–39. doi:10.1162/ijlm_a_00080. ↑ Pandey, S.; Gupta, B.; Nahata, A. (2013). "Complex Geometry Plasmonic Terahertz Waveguides Created via 3D Printing". Cleo: 2013. pp. CTh1K.CTh12. doi:10.1364/CLEO_SI.2013.CTh1K.2. ISBN 978-1-55752-972-5. ↑ Fletcher, JC (August 28, 2008). "Virtually Overlooked: Mario Artist". Retrieved 2014-06-14. ↑ "Mario Artist: Polygon Studio". Retrieved 2014-06-14. ↑ ewilhelm. "3D printed clock and gears". Instructables.com. Retrieved 2013-10-30. ↑ 23/01/2012 (2012-01-23). "Successful Sumpod 3D printing of a herringbone gear". 3d-printer-kit.com. Retrieved 2013-10-30. ↑ ""backscratcher" 3D Models to Print - yeggi". ↑ Sanderson, Katharine. "Make your own drugs with a 3D printer". ↑ Cronin, Lee (2012-04-17). "3D printer developed for drugs" (video interview [5:21]). Glasgow University: BBC News Online. Retrieved 2013-03-06. ↑ D'Aveni, Richard (March 2013). "3-D Printing Will Change the World". Harvard Business Review. Retrieved 2014-10-08. ↑ "3D printable SLR brings whole new meaning to "digital camera"". Gizmag.com. Retrieved 2013-10-30. ↑ Schelly, C., Anzalone, G., Wijnen, B., & Pearce, J. M. (2015). "Open-source 3-D printing Technologies for education: Bringing Additive Manufacturing to the Classroom." Journal of Visual Languages & Computing. ↑ Grujović, N., Radović, M., Kanjevac, V., Borota, J., Grujović, G., & Divac, D. (2011, September). "3D printing technology in education environment." In 34th International Conference on Production Engineering (pp. 29–30). ↑ Mercuri, R., & Meredith, K. (2014, March). "An educational venture into 3D Printing." In Integrated STEM Education Conference (ISEC), 2014 IEEE (pp. 1–6). IEEE. ↑ Gonzalez-Gomez, J., Valero-Gomez, A., Prieto-Moreno, A., & Abderrahim, M. (2012). "A new open source 3d-printable mobile robotic platform for education." In Advances in Autonomous Mini Robots (pp. 49–62). Springer Berlin Heidelberg. ↑ J. Irwin, J.M. Pearce, D. Opplinger, and G. Anzalone. The RepRap 3-D Printer Revolution in STEM Education, 121st ASEE Annual Conference and Exposition, Indianapolis, IN. Paper ID #8696 (2014). 1 2 Zhang, C.; Anzalone, N. C.; Faria, R. P.; Pearce, J. M. (2013). De Brevern, Alexandre G, ed. "Open-Source 3D-Printable Optics Equipment". PLoS ONE. 8 (3): e59840. doi:10.1371/journal.pone.0059840. PMC 3609802 . PMID 23544104. ↑ "3D Printing in the Classroom to Accelerate Adoption of Technology". ↑ Kostakis, V.; Niaros, V.; Giotitsas, C. (2014). "Open source 3D printing as a means of learning: An educational experiment in two high schools in Greece". Telematics and Informatics. 32: 118–128. doi:10.1016/j.tele.2014.05.001. ↑ "Underwater City: 3D Printed Reef Restores Bahrain's Marine Life". ptc.com. 2013-08-01. Retrieved 2013-10-30. ↑ Scopigno, R.; Cignoni, P.; Pietroni, N.; Callieri, M.; Dellepiane, M. (November 2015). "Digital Fabrication Techniques for Cultural Heritage: A Survey". Computer Graphics Forum: n/a. doi:10.1111/cgf.12781. ↑ "Museum uses 3D printing to take fragile maquette by Thomas Hart Benton on tour through the States". 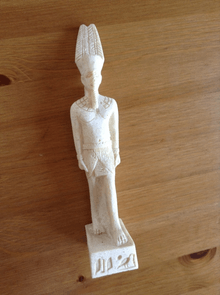 ↑ "British Museum releases 3D printer scans of artefacts". 2014-11-04. ↑ "Threeding Uses Artec 3D Scanning Technology to Catalog 3D Models for Bulgaria's National Museum of Military History". 3dprint.com. 2015-02-20. ↑ "$5,000 3D printer prints carbon-fiber parts". MarkForged. ↑ "Researchers at UC Berkeley Create Bloom First Ever 3D-printed Cement Structure That Stands 9 Feet Tall". cbs sanfrancisco. 6 March 2015. Retrieved 23 April 2015. ↑ Chino, Mike (9 March 2015). "UC Berkeley unveils 3D-printed "Bloom" building made of powdered cement". Retrieved 23 April 2015. ↑ Fixsen, Anna (6 March 2015). "Print it Real Good: First Powder-Based 3D Printed Cement Structure Unveiled". Retrieved 23 April 2015. ↑ Thompson, Clive (30 May 2012). "3-D Printing's Legal Morass". 1 2 Weinberg, Michael (January 2013). "What's the Deal with copyright and 3D printing?" (PDF). Institute for Emerging Innovation. Retrieved 2013-10-30. ↑ "Homeland Security bulletin warns 3D-printed guns may be 'impossible' to stop". Fox News. 2013-05-23. Retrieved 2013-10-30. ↑ Cochrane, Peter (2013-05-21). "Peter Cochrane's Blog: Beyond 3D Printed Guns". TechRepublic. Retrieved 2013-10-30. ↑ Gilani, Nadia (2013-05-06). "Gun factory fears as 3D blueprints put online by Defense Distributed". Metro.co.uk. Retrieved 2013-10-30. ↑ "Liberator: First 3D-printed gun sparks gun control controversy". Digitaljournal.com. Retrieved 2013-10-30. ↑ "First 3D Printed Gun 'The Liberator' Successfully Fired". International Business Times UK. 2013-05-07. Retrieved 2013-10-30. ↑ "US demands removal of 3D printed gun blueprints". neurope.eu. Retrieved 2013-10-30. ↑ "España y EE.UU. lideran las descargas de los planos de la pistola de impresión casera". ElPais.com. 2013-05-09. Retrieved 2013-10-30. ↑ "Controlled by Guns". Quiet Babylon. 2013-05-07. Retrieved 2013-10-30. ↑ "3dprinting". Joncamfield.com. Retrieved 2013-10-30. ↑ "State Dept Censors 3D Gun Plans, Citing 'National Security'". News.antiwar.com. 2013-05-10. Retrieved 2013-10-30. ↑ "Wishful Thinking Is Control Freaks' Last Defense Against 3D-Printed Guns". Reason.com. 2013-05-08. Retrieved 2013-10-30. ↑ Lennard, Natasha (2013-05-10). "The Pirate Bay steps in to distribute 3-D gun designs". Salon.com. Archived from the original on 2013-05-19. Retrieved 2013-10-30. ↑ "Sen. Leland Yee Proposes Regulating Guns From 3-D Printers". CBS Sacramento. 2013-05-08. Retrieved 2013-10-30. ↑ "Schumer Announces Support For Measure To Make 3D Printed Guns Illegal". ↑ "Four Horsemen of the 3D Printing Apocalypse". Makezine.com. 2011-06-30. Retrieved 2013-10-30. ↑ Ball, James (10 May 2013). "US government attempts to stifle 3D-printer gun designs will ultimately fail". The Guardian. London. ↑ Gadgets (2013-01-18). "Like It Or Not, 3D Printing Will Probably Be Legislated". TechCrunch. Retrieved 2013-10-30. ↑ Klimas, Liz (2013-02-19). "Engineer: Don't Regulate 3D Printed Guns, Regulate Explosive Gun Powder Instead". The Blaze. Retrieved 2013-10-30. ↑ Beckhusen, Robert (2013-02-15). "3-D Printing Pioneer Wants Government to Restrict Gunpowder, Not Printable Guns". Wired. Retrieved 2013-10-30. ↑ Bump, Philip (2013-05-10). "How Defense Distributed Already Upended the World". The Atlantic Wire. Archived from the original on 2013-05-19. Retrieved 2013-10-30. ↑ "News". European Plastics News. Retrieved 2013-10-30. ↑ "CDC - NIOSH Research Rounds - Volume 1, Issue 12, June 2016". www.cdc.gov. Retrieved 2016-11-16. ↑ "Confronting a New 'Era of Duplication'? 3D Printing, Replicating Technology and the Search for Authenticity in George O. Smith's Venus Equilateral Series". Durham University. Retrieved July 21, 2013. ↑ "Materializing information: 3D printing and social change". Retrieved 2014-01-13. ↑ "Additive Manufacturing: A supply chain wide response to economic uncertainty and environmental sustainability" (PDF). Retrieved 2014-01-11. ↑ "Materializing information: 3D printing and social change". Retrieved 2014-03-30. ↑ "RepRap Options". Retrieved 2014-03-30. ↑ "3D Printing". Retrieved 2014-03-30. 1 2 3 4 Kostakis, V. (2013): At the Turning Point of the Current Techno-Economic Paradigm: Commons-Based Peer Production, Desktop Manufacturing and the Role of Civil Society in the Perezian Framework.. In: TripleC, 11(1), 173–190. ↑ Kostakis, V.; Papachristou, M. (2014). "Commons-based peer production and digital fabrication: The case of a RepRap-based, Lego-built 3D printing-milling machine". Telematics and Informatics. 31 (3): 434–443. doi:10.1016/j.tele.2013.09.006. ↑ Kostakis, V; Fountouklis, M; Drechsler, W (2013). "Peer Production and Desktop Manufacturing: The Case of the Helix-T Wind Turbine Project". Science, Technology & Human Values. 38 (6): 773–800. doi:10.1177/0162243913493676. ↑ Sharma, Rakesh. "Can 3D Printing Reshape Manufacturing In America?". Forbes.com. Tran, Jasper (2017). "Reconstructionism, IP and 3D Printing". available on SSRN. Tran, Jasper (2016). "Press Clause and 3D Printing". Northwestern Journal of Technology and Intellectual Property. 14: 75–80. Tran, Jasper (2016). "3D-Printed Food". Minnesota Journal of Law, Science and Technology. 17: 855–80. Tran, Jasper (2015). "To Bioprint or Not to Bioprint". North Carolina Journal of Law and Technology. 17: 123–78. Tran, Jasper (2015). "Patenting Bioprinting". Harvard Journal of Law and Technology Digest. Tran, Jasper (2015). "The Law and 3D Printing". John Marshall Journal of Information Technology and Privacy Law. 31: 505–20. "Results of Make Magazine's 2015 3D Printer Shootout". docs.google.com. Retrieved 1 June 2015. "Evaluation Protocol for Make Magazine's 2015 3D Printer Shootout". makezine.com. Retrieved 1 June 2015. Vincent; Earls, Alan R. (February 2011). "Origins: A 3D Vision Spawns Stratasys, Inc.". Today's Machining World. Oak Forest, Illinois, USA: Screw Machine World Inc. 7 (1): 24–25. "Heat Beds in 3D Printing – Advantages and Equipment". Boots Industries. Retrieved 7 September 2015. Albert, Mark (17 January 2011). "Subtractive plus additive equals more than ( - + + = > )". Modern Machine Shop. Cincinnati, Ohio, USA: Gardner Publications Inc. 83 (9): 14. Stephens, B.; Azimi, P.; El Orch, Z.; Ramos, T. (2013). "Ultrafine particle emissions from desktop 3D printers". Atmospheric Environment. 79: 334–339. doi:10.1016/j.atmosenv.2013.06.050. Easton, Thomas A. (November 2008). "The 3D Trainwreck: How 3D Printing Will Shake Up Manufacturing". Analog. 128 (11): 50–63. Wikimedia Commons has media related to 3D printing. Look up 3D printing in Wiktionary, the free dictionary.